Turns to XM Satellite Radio Mode. XM mode toggles in order to XM1 ➟ XM2 ➟ XM3 ➟ XM1... when the button is pressed each time. Displays the information of the current channel in the order of Artist/Song title ➟ Category/Channel name ➟ Current Play Channel ➟ Artist/Song title ➟ Category/ Channel name... when the button is pressed each time. If it can not display the whole text information, rotate the tune button to see the next page. Push [TRACK ] button for less than 0.8 second to select previous channel. Push [SEEK ] button for less than 0.8 second to select next channel. 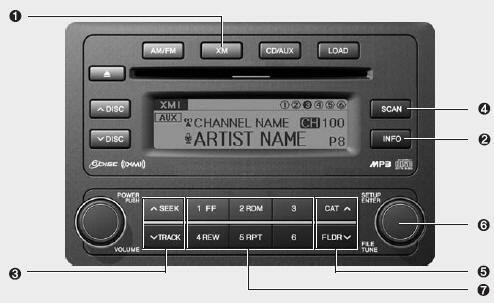 Radio ID : Seek or Tune to XM channel 0 to display the Radio ID. Press to hear a brief sampling of all channels. To cancel the scan mode, press the button once again. Push [FLDR ] button to search previous category. Push ~ buttons less than 0.8 second to play the channel saved in each button. Push [PRESET] button for 0.8 second or longer to save current channel to the respective button with a beep.